Aloft on wing, seen then unseen. 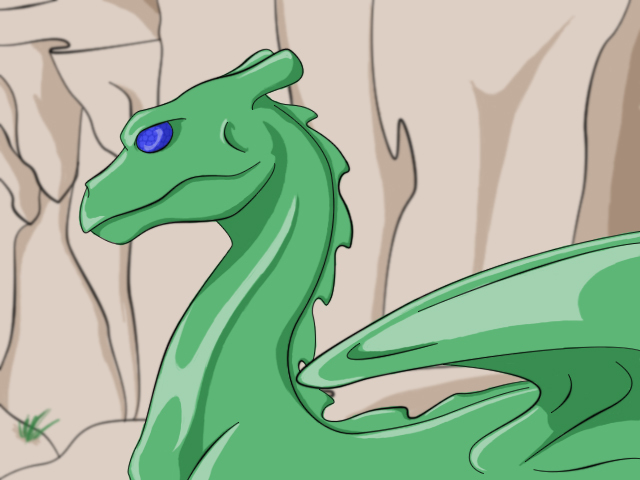 Danae's green dragon, Leth, from the Crevice Weyr game. I'm eh on the shading, but I really like how she came out overall. Leth is a slightly lighter shade of green than most anyway. The faceting in the eyes worked! Hurray for the mosaic filter. Background is decent. And look, she's laying on her ledge and you can see another weyr up there. Go me. I'm going to pretend her other wing is back a little, hence why you can't see it, because I'm too lazy to go back and add it in right now. Leth is mine. Anything Pern related, which she's from, belongs to Anne McCaffrey. Yaaay! DragonRiders of Pern fanart! <3333 Awesome job on this dragon! You even got the faceted eyes perfectly. ^^ I love it, and the coloring's amazing. :) Great job! Wow! That's amazing. Nice colouring.